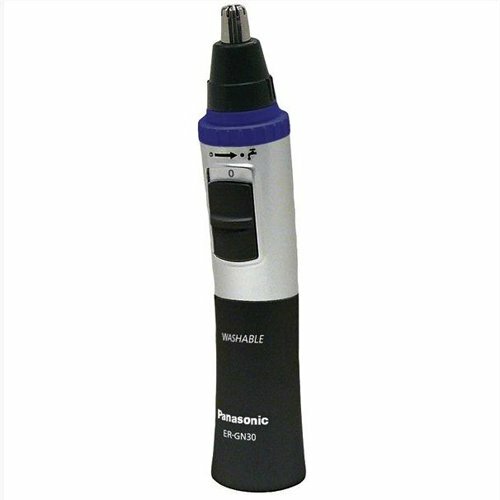 This is the summary of consumer reviews for Panasonic ER-GN30-K Vortex Wet/dry Nose and Facial Hair Trimmer. The BoolPool rating for this product is Very Good, with 4.40 stars, and the price range is $12.48-$17.99. This hair trimmer works well for nose and ear hair trimming. For the 3 days this item worked, it worked well. This product worked well for 7.5 months. Cleaning the tip with water works well. Well, turns out it works GREAT. worked good for 2 weeks then just completely stopped working. In fact it works very well. The product worked very well for 6 weeks, and then promptly broke. It worked quite well when it did work, was very happy with it. The dual-edge blade really is better than the old blades. - Great blade washing/cleaning system. They want $22 for a replacement little blade. The blade this replaced was one of 5 uses for a similarly cheap groomer, and it worked infinitely better. The blade is very fragile and costs $13.63. Next time I'll try to find a brand with inexpensive replacement blades. It can be washed with water with a special switch right below the blade. The only place I could find a replacement blade is Panasonic. The rounded cap on top has a blade on the inside, the blade is placed slightly lower than the tip of the cap. Efficient, well built, reasonably priced solution to facial hair trimming. It trims 95% of the hair. I was shocked by how close of a trim this product offered and how quickly it trimmed the hair. The rotary function made accurate trimming a bit tricky. Off course the unit can also be used to trim and neaten your eyebrow and facial hair. This groomer is a powerful accessory to any mans trimming options. The one negative in my view, and it's appreciably minor, is the rotary configuration doesn't work as well for eyebrow trimming. It does a remarkable job in the trimming of all your facial hair including those little hard to get to places. This works perfectly, no pulls, nice clean cuts. Doesn't pull hair, it's quiet, cuts all hair without skipping. Cuts reasonably closely, no pulling, relatively quiet and easy to handle. FAIRLY CLOSE CUT: According to the instructions, this cuts to 0.5mm or 1/64 of an inch. This model is definitely adequate and doesn't cut the skin. this trimmer is strong and cuts great. It's safe, cutting only hair and not skin. Doesn't cut as closely as older models. It really should be more powerful and cut more closely. feels very cheaply made and it cuts slowly. *Easy to clean. (wet or dry). Easy to clean up/clean out. It cuts great and easy to clean as well. Very easy to use and clean (interesting to have multiple cleaning options), works well, compact, performs as advertised. Love the fact that it's easy to clean and maintain. Very easy to use and clean up is a snap. This trimmer is comfortable to use, and easy to clean. the battery power is lost if you leave the battery in it. * Burns through batteries: After 2 uses, a fresh battery had no juice left. ON rechargeable batteries: They aren't recommended as Alkaline will give it the power it needs...however, I found that this trimmer works just FINE with a Eneloop battery and is just as strong as with an Alkaline battery. It takes a AA battery, and although others mention that using a rechargeable battery will produce undesirable results, I'd no problems at all using an Eneloop, although I'll often rotate many of my rechargeable batteries, so maybe that's the trick. The power wouldn't stay on, even with a fresh alkaline battery, as if the battery wasn't connecting with the unit. Still using the original battery too! When I got home, I tried a different battery but it still wouldn't work. In addition to quitting after a short time, they also go through batteries very quickly.